Ships today if you order in the next 13 hours 41 minutes. Don't let trouble swallowing keep you from getting nourishment from a quality multivitamin. Allergy Research offers its Children's Multi-Vi-Min. The capsules are a size 3 - or about 1 centimeter in length - making them much easier to swallow. But while this multi is formulated with children in mind, it can also be ideal for adults who struggle with swallowing supplements. Vitamin C is excluded from this selection on purpose - in order to reduce the potential for excess iron absorption. For younger children, these vitamins can be opened up and put into food or drink for consumption. As with all Allergy Research products, this dietary supplement contains only ingredients of the highest-quality and purity available. It is free of all common allergens and contains no preservatives, diluents, or artificial additives. 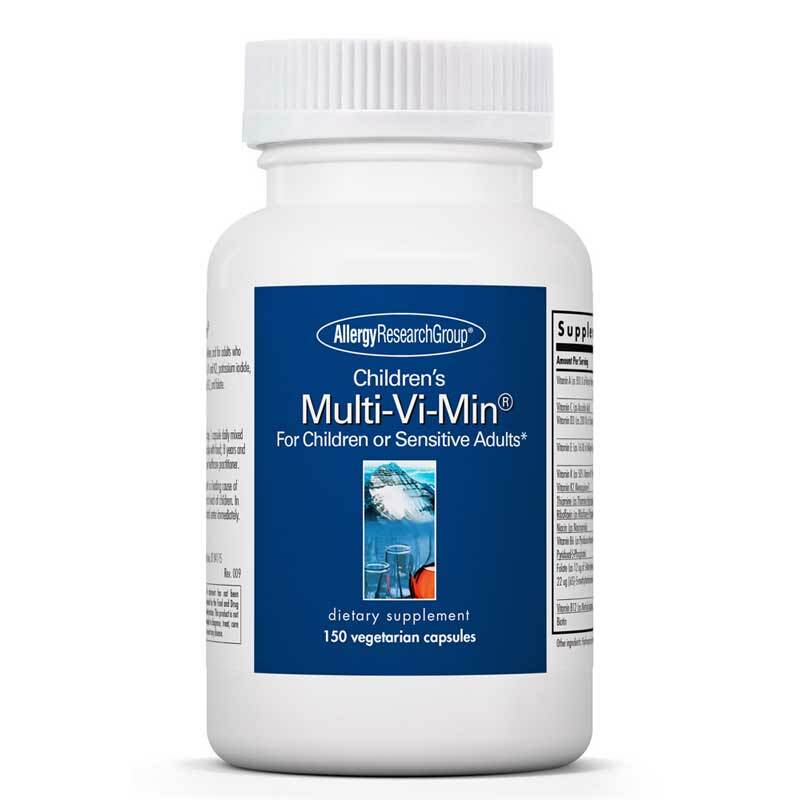 Get Children's Multi-Vi-Min from Allergy Research Group and easily take your vitamins without choking them down. 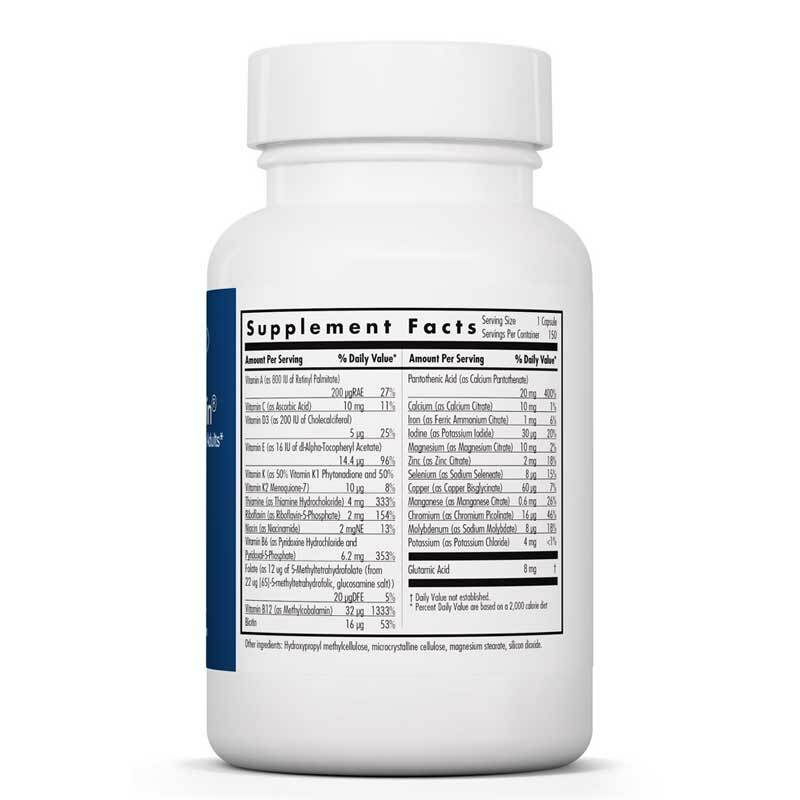 Adults and children (age 4 and up): 1 capsule daily per ten pounds of body weight, taken with meals, or as directed by your health care professional. Childrens Multi-Vi-Min capsules may also be opened and sprinkled into desired liquid. For children under the age of 4: please consult you healthcare professional before use. Accidental overdose of iron containing products is a leading cause of fatal poisoning in children under 6. Keep this product out of reach of children. In case of accidental overdose, call a doctor or a poison control center immediately. 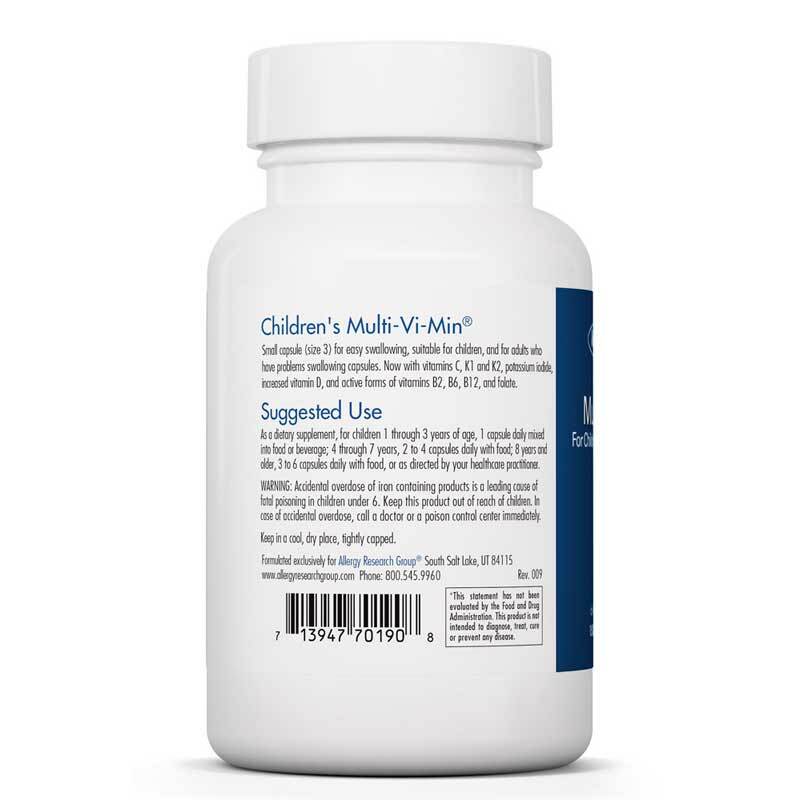 Childrens M-V-M is a very good multivitamin because it is all natural with no harsh ingredients, plus it is very easy to swallow for most kids (4 out of 5 in my home). A solution would be to mix it in applesauce or uncooked food. My only complaint is your child has to take 1 pill for every 10 pounds that he/she weighs. It could end up being more costly than you are looking for. As long as you know these facts and still want to purchase it, then I would recommend it. In the mean time, I am looking for another children's multivitamin.